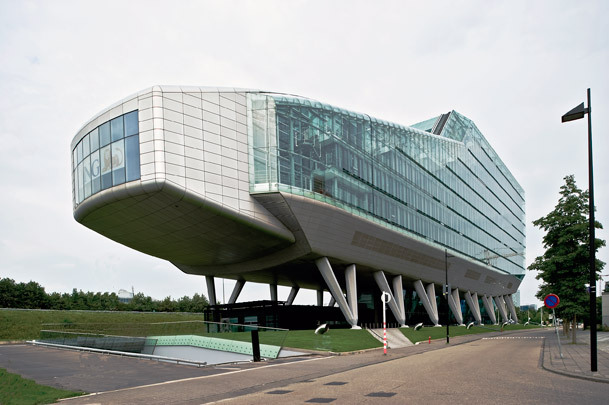 ING, the Dutch bank and insurance group, required an open, transparent head office that was to be innovative and ecologically friendly. Its glass and anodized aluminium torso is lifted clear of the ground to prevent part of the workforce from looking out onto the embankment of the motorway running alongside. The building increases in height as it proceeds from the green area around the water (Nieuwe Meer) to the future development at the Zuidas (Southern Axis). Its lowered head contains the jutting auditorium with its window wall offering a panoramic prospect of that green space. A glass entry zone sits between the splayed legs. Inside, one is confronted by turns with open indoor and outdoor gardens, atria, loggias and a multitude of glass partitions - a most literal rendition of the openness and transparency required by the client. The building’s innovation and environmental friendliness are most powerfully evident in the state-of-the-art climate control system. Its double glass casing enables natural ventilation while excluding the roar of traffic. An underground heat and cold storage system acts as an effective energy-saving device.